Hi loves! Another new weekly post. I want to take you back and look at what was posted a year ago. Who knows, maybe you didn't know this site back then, or maybe you just forgotten about the fun things we shared! This combination of OPI Tease-Y Does It and Nubar 2010 is just amazing and so season appropriate! These 2 a england shades just are a perfect match! Saran wrap marbles are so easy to achieve a beautiful look. Wednesday 31 Day Nail Art Challenge - Half Moon Nails! Aaaah, my black & white look I did last year. Still love this! Isn't this H&M polish just perfect? I might need to wear that again! Magic Twin Post - Multichrome Gradient! Friday Magic Twin Post - Multichrome Gradient! Angie from Glitter and Unicorns had this wonderful idea of doing a gradient with multichromes. Mine didn't turn as amazing but oh well! Stamping has been one of my favorite nail arts for a long time and looking back at this reminds me I should use my BM plates again :-). Because Sabine went on vacation she asked me to do a guestpost for her and this is the look I created ^^. These are gorgeous, but the Nubar mani from Monday is my favorite! That guest post mani is my total favorite - that's a great manicure! 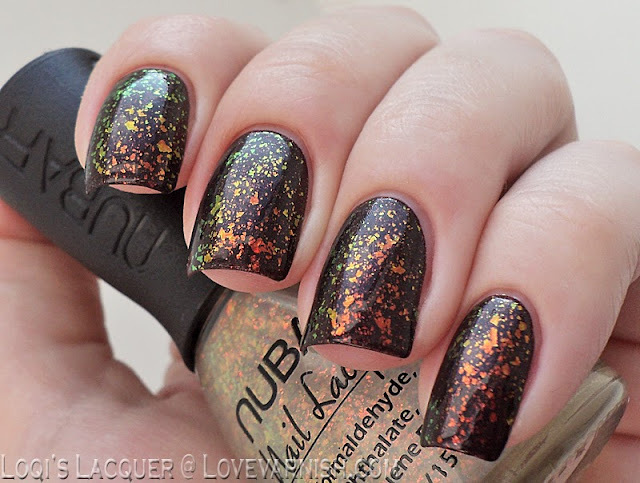 That NUBAR! I'm not kidding I just drooled on my hand. I love this series! My favorite is your guest post for Sabine. I love plastic wrap manis! The last mani is amazing! Love the color combo. They are so quick and easy but give such a wonderful effect :).